Some classic cuts are receiving new homes. Designer Amanda Ghassaei, who has previously worked with 3D printing, moved over to laser cutting technology to create wooden LPs, as well as some on acrylic and paper. She managed to put classics records from Radiohead and Velvet Underground on maple. With a “theoretical precision of 1200dpi,” the records don’t exactly boast strong audio qualities. Ghassaei estimates the bit rate to be between four and five, with a crusty-yet-manageable sample rate of 4.5kHz (typical mp3 quality is 44.1kHz). The reason for the low quality, as explained by Ghassaei, is that the laser is too wide to cut the very-thin grooves needed for higher sound quality. Each song sort of sounds like an MP3 that’s been ripped about 2000 times, transferred to cassette, then copied another 20 times. While this doesn’t exactly lend to deep, active listening with those $200 headphones you just bought, it has the possibility of refinement. 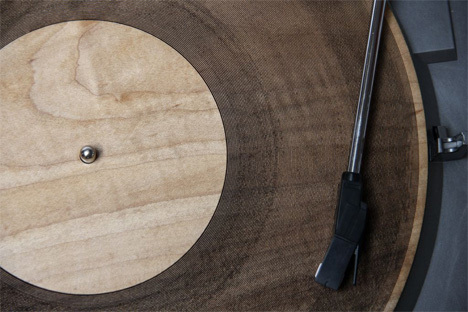 Ghassaei has created an Instructables page for the project, complete with instructions and code to make your own records. We can already feel the pretentious indignation of vinyl devotees around the world. See more in Digital Design or under Technology. May, 2013.